This was an interesting storm for several reasons. First, it was a November tornado. Actually, we shouldn’t be that surprised at this because the Ozarks have always had a significant “second season” of tornadoes which peaks in November and December, especially when it comes to outbreaks of tornadoes. November, and all of the months of winter too, are considered to be the “cool season” with regard to tornado development. Most people don’t think of this period as being a particularly threatening time for tornadoes. But the fact is that when tornado conditions develop during the cool season, the tornado threat is just as real as anything in the heart of May! Cool season tornadoes are dangerous for reasons beyond just public apathy. Because the length of daylight is very short, it is likely that cool season tornadoes will be nocturnal. (occurring at night) Now, they may simply be late afternoon or evening storms which are nocturnal because of the time of year. Or they may be storms which develop after the late news or worse after the majority of people of gone to bed. Such overnight storms are often aided by the natural strong jet stream patterns found during the cool season which can force tornadic conditions anytime , not necessarily favoring the peak heating of late afternoon and evening. This tornado touched down before sunset. In the writing of this report, I requested the radar data archive for this date. It showed a broken line of storms, many of which were taking on supercell characteristics. I recorded a loop of these storms in the 5 o’clock hour. The green triangle is a “scit” where the computer has tagged tight rotation in a storm. 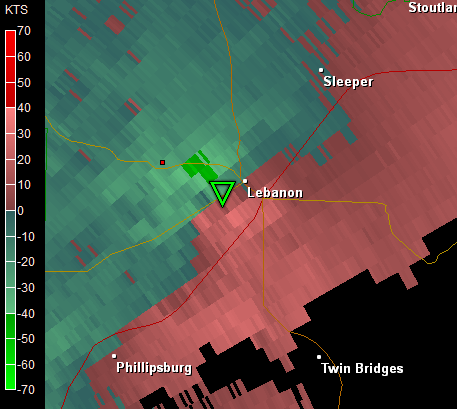 It lasts for two frames or about eight minutes as it zips across south Lebanon. This tornado tore apart Tracker Marine in Lebanon, throwing boats everywhere. It crossed I-44 and did other damage to homes. What I really find quite interesting in this post analysis of the event is the intensity of a storm immediately to the southwest of the Lebanon storm, also shown in the radar loop. This storm had a more persistent and stronger rotation couplet associated with it reaching a peak near Twin Bridges south of Lebanon at around 5:24 pm! Yet there were no tornado reports with this storm. A curiosity. One last note: this tornado occurred ahead of a powerful cold front! I distinctly remember working this night and while trying to stay ahead of the tornado warnings, I glanced over into eastern Kansas and saw what sure looked like a signature of snow on radar there! In fact, it was snow and the area received a light accumulation of snow later that night and early in the morning!